People with multiple computer systems sometimes need to exchange data between the computers, and sometimes they need to make sure that the same data set is available on all machines. This is for instance true for emails, calendar events or local copies of websites if the person is a web developer. Syncing refers to the process of making sure that files are available on all connected computer systems, and Windows Live Sync is one of the software programs to achieve this goal. Windows Live Sync is part of Microsoft's Windows Live software suite. A Windows Live account is needed to use the program, users without one can create a free account easily at the Windows Live website. The Windows Live Sync software is available on that website, for Windows and Mac systems actually, as well. The software needs to be installed on every system that needs to be included in the synchronization process. The program places an icon in the system tray after installation which contains links to settings and preferences. Start with a left-click on the icon and the selection of Sync Website. 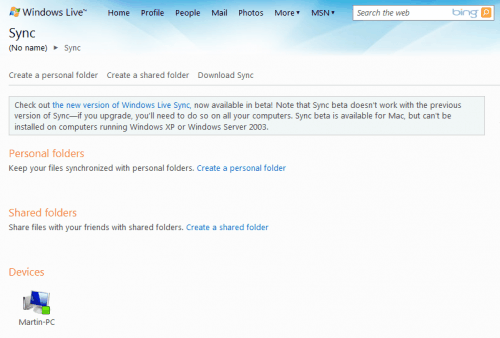 This opens the Windows Live Sync website with options to configure personal and shared folders. Personal folders are only accessible by the user account creating them while shared folders can be shared with Windows Live friends. All folders of linked computers can be selected for synchronization. It is for instance possible to select the documents folder to be synced with all other computers, the Firefox or Thunderbird profile, Outlook emails or anything else that is stored in folders. 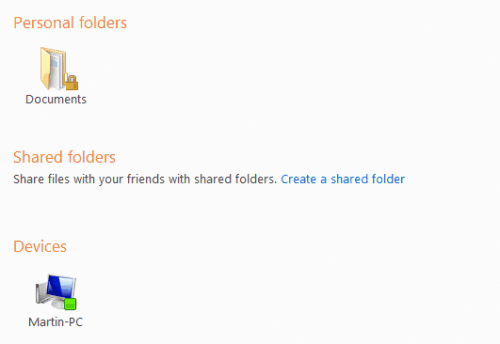 Each personal or shared folder that is added this way is displayed on the Windows Live Sync startup screen along with the different computer systems configured to sync those selected folders. The selected folders can be configured individually to either synchronize the folders automatically whenever the PC has an online connection and Windows Live Sync is running or on-demand which will only synchronize the data if it is accessed by a user. Windows Live Sync has several limitations. It is for instance not recommended to sync data that is in use on more than one computer system as it can lead to sync errors and other problems. Windows Vista and Windows 7 users have the option to download Windows Live Essentials Sync Beta instead which offers several additional features including storing data on Windows Live SkyDrive to access the data from web browsers. It has to be noted that this version of Sync is available as a beta, and therefor not suited for productive environments without proper testing. The main benefit of Windows Live Sync is that it is easy to use. It takes only a few clicks to configure the whole syncing process. The synchronization should work out of the box on most computer systems, the settings of the program contain options to test the ports that are needed to sync the data. Any reason why you should use MS Sync instead Dropbox except the offered storage size? Well you do not need to create a new account if you already have a Windows Live account, and you do not need to move locations on the local drive or work with symbolic links to synchronize specific contents. I’m currently using neither of both but I think the latest Dropbox supports individual folders. So no need for symbolic links.